In a contest between Man and nature, nature always wins. Act accordingly. So it’s been just about 10 months since Redemption was put in the water. Most of that time was at Lake Catherine Island Marina, and the remaining couple months was at the new dock a tad further into Lake Pontchartrain. I had to pick the boat up last month to fix some lightning damage we incurred from a direct lightning strike a few months back. The damage wasn’t significant to hull and rig, but we did lose a good portion of our mast lights and electronics. 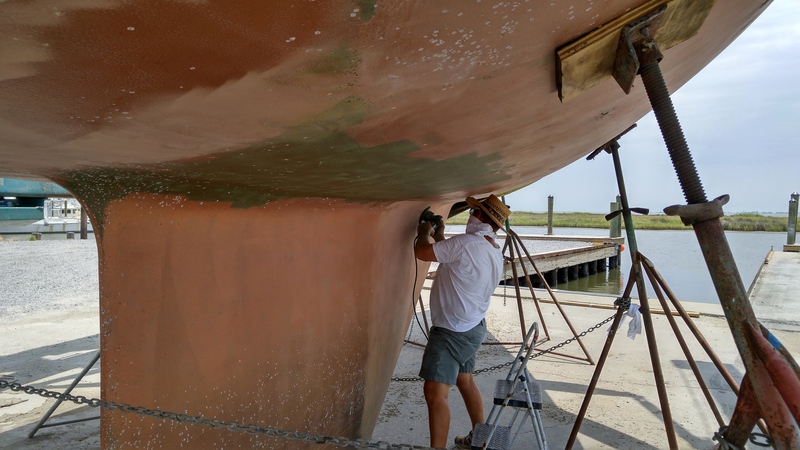 For a bit of history, if you’re just now getting on board here, we decided for our anti-fouling paint to apply a copper powder loaded epoxy, using MAS epoxy. It was applied then sanded, or “burnished” whatever you call it, and put in the water. That’s it, that’s all. Since then it has been in saltier, brackish water untouched, never scrubbed or cleaned for just under 10 months(December 2014 to July 2015). Most of the time had been in a shallow silted-in slip at the yard, the other was at the marina where Redemption berths. When we picked it up this is what it looked like. Not too shabby, some places better than others but overall not too terrible. 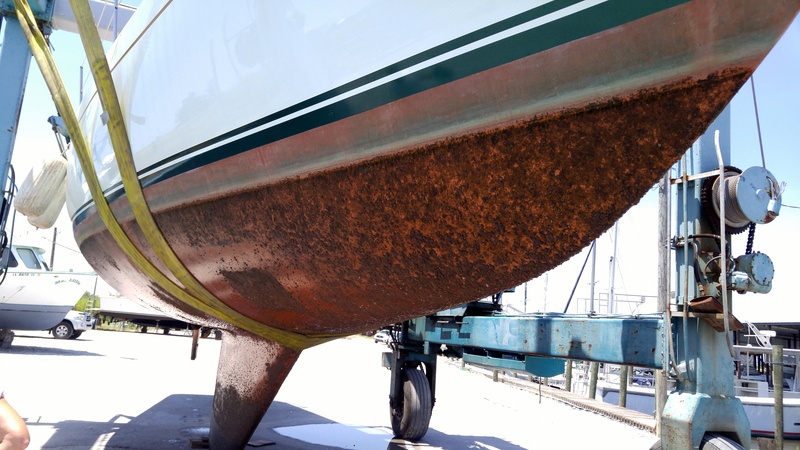 Now some of you are thinking, guys why not just use regular name brand anti-fouling paint like everyone else? That’s a very legitimate question and I will be sure to answer it! We chose this for out anti-fouling system for a couple reasons. First, it was essentially free, can’t beat free and in this case it is the good “free” free kind (as opposed to the kind of free that always costs you more than it actually costs new). The good thing about this epoxy coating is that, in the event it may not work like planned or I do want to put a traditional paint on, it is just another layer of barrier coat which is never a bad thing. Second, we have seen first hand a boat picked up at our marina (when my folks owned it before retirement) that it can in fact work, so I couldn’t argue against it. Lastly, I like to experiment with things some times especially if is has mixed reviews. Sometimes I lose, and sometimes I win. Considering the first reason, I took a big leap of faith with this. Regardless of whether it works or not, it did make some awesome photos when it was first applied and Redemption was freshly painted! Now would you just look at that?! Now for the lightning damage! 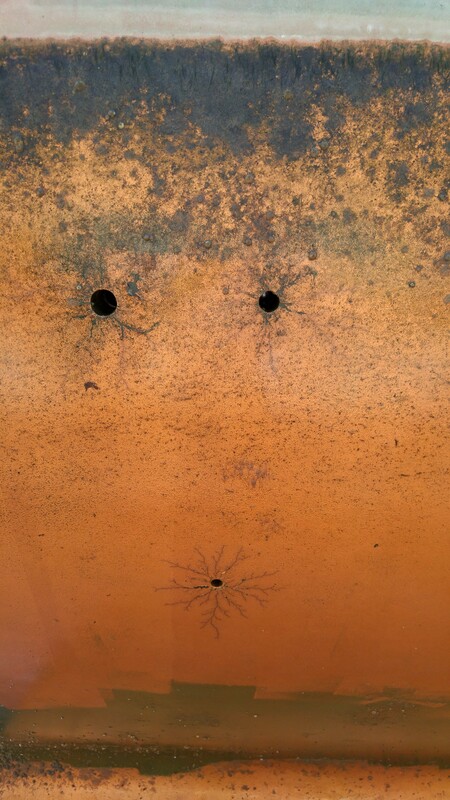 I was surprised, shocked if I may, to see how far the lightning jumped around on the boat. It seemed to have only gone out through the thru-hulls and only a select few at that. Out of the 14 thru-hulls, 7 had signs of exit and 3 had any real damage to the fairing. 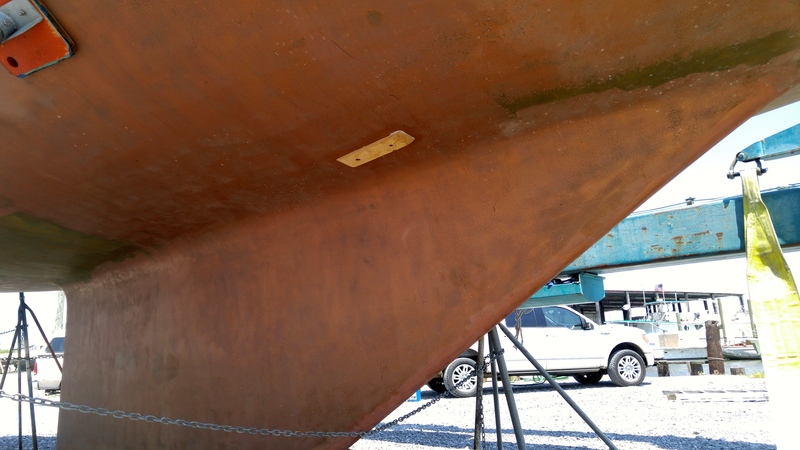 What’s also neat is the exit marks on the hull in the copper paint. 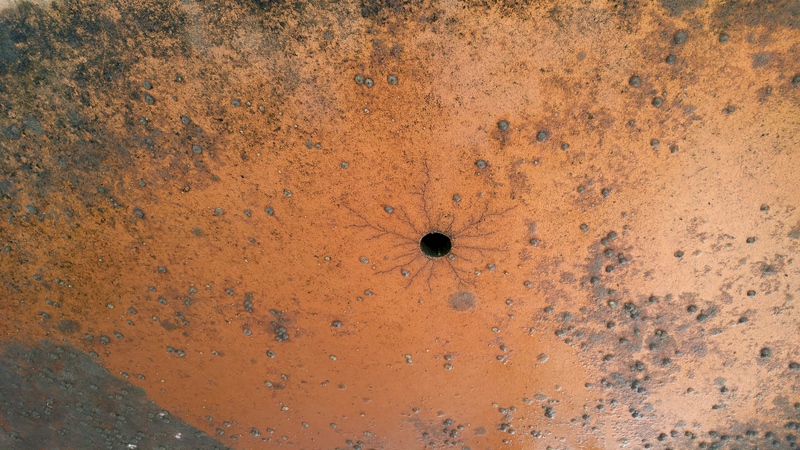 The way the lightning exited the boat reminds me of a cross between a snow flake and spider webs. Just goes to show just how much copper we have in that epoxy. 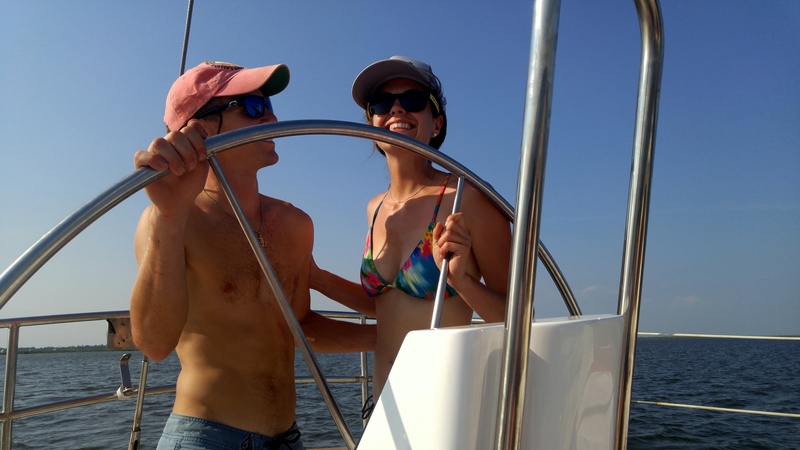 Take note that I have nothing bonded on my boat sans the propulsion equipment. 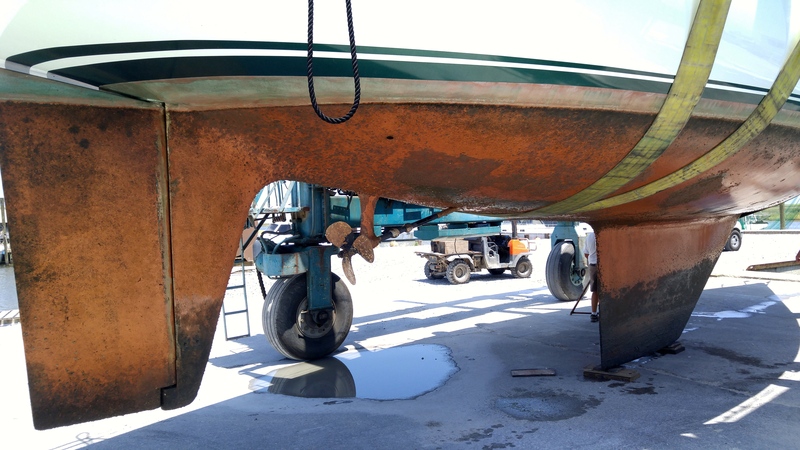 Fortunately, everything was surface damage as the fiberglass hull was fine, thank God! After the washing, I ground out the damaged fairing on the ones that were blown out a little. Checked to make sure the sealant wasn’t burned or compromised around the fittings, then put more fiberglass putty to fair them back smooth. 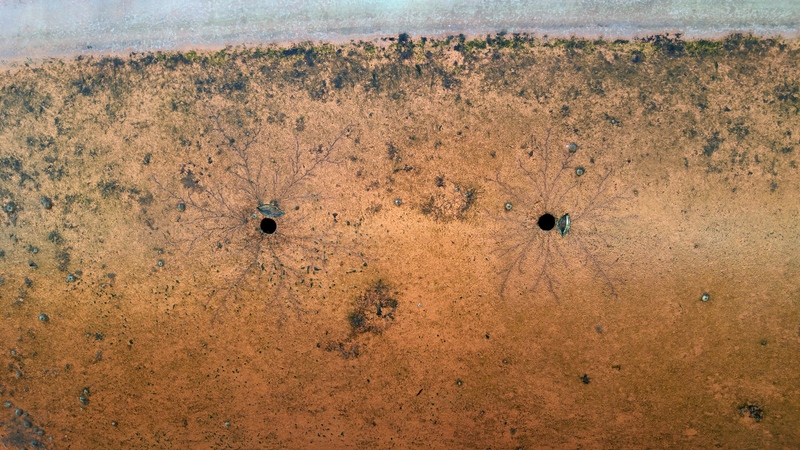 The affected areas were sanded down and we re-applied more copper epoxy. Once it was cured the whole bottom was burnished again, as we figured it wasn’t quite sanded enough the first go around. To help prevent this in the future, I installed a Newmar 12C ground plate to bond the mast and chainplates to in the near future. Though, as with lightning nothing is a guarantee so this is just theory in practice. Also, if I can use it in tandem with a SSB if I get one, though I’m no expert.. While it was up we installed two 2″ thru-hulls with Forespar Marelon ball valves in the transom under the overhang but above the water line for mainly cockpit drains. These will also be for drains for the propane locker on STBD, Port storage locker, and the emergency tiller access compartment. This will allow me to close all major thru-hulls, minus a couple bilge pumps, when I leave the boat and still be able to have the cockpit drain during a rainstorm. 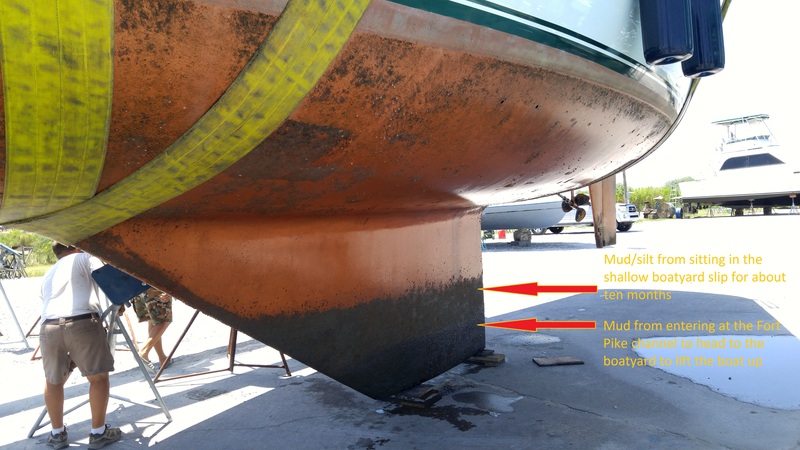 Not only that, but in the event we get pooped, sailor term to take a large wave over the stern, I will have two 1.5″ seacocks and two 2″ thru-hulls to allow water to drain. 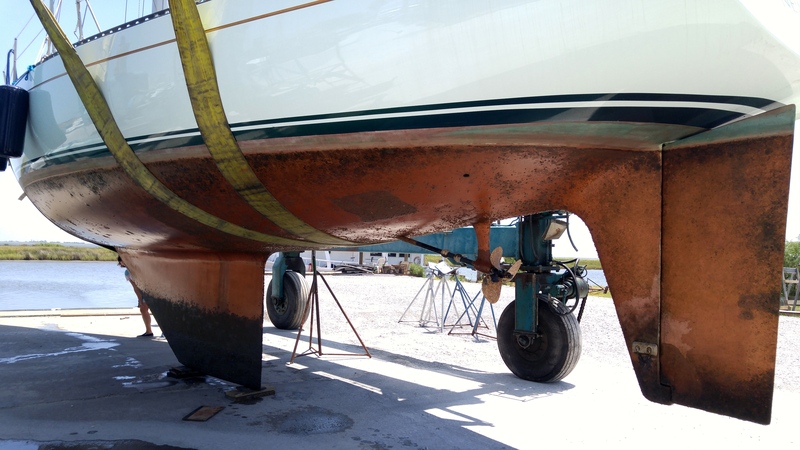 Lastly, before we put Redemption back into the water, Michelle washed the topsides, she’s awesome I know, and we tag teamed polishing the boat with another coat of the Star Brite marine polish with Teflon. Works like a charm and lasts longer than other products I have used. Cleaned up and ready to go, we launched her and over the next two days sailed back home for the first time ever! 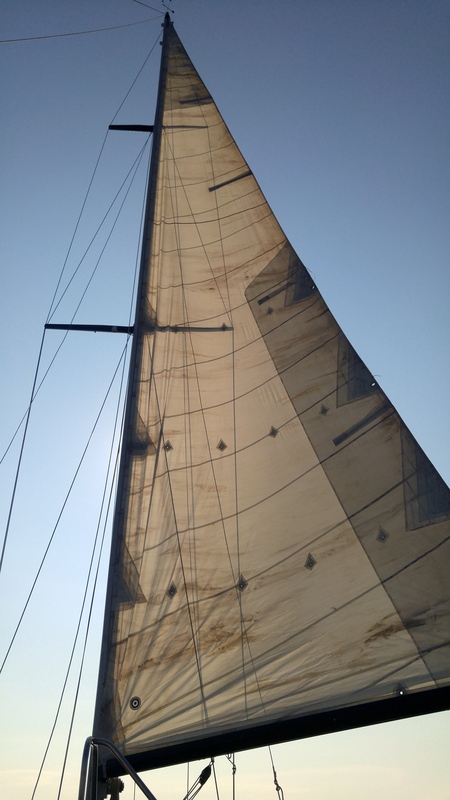 It was such a joy when we hoisted the sails for the first time! We can’t wait to do it again more and more in the future. Thanks for the very interesting post! It seems that that copper paint it’s very effective, do you know which brand did you put on? Yeah I am studying the CopperCoat product to understand it better. There are mixed reviews about it and also people who do homemade mix with epoxy and copper. Hi Ronnie! Found your site from the comment you made on our site .. so glad you found us. Seems like everyone has a blog nowadays. Sounds like you put your boat in the water (the first time) about the time we took ours out. We were hoping to splash before New Year’s but as you know .. the weather sucked. We’re hoping to get her in the water by this weekend. It’s been a long year! Sorry to hear about the lightning damage! Glad she’s back in the water … she’s beautiful! BTW, Ken & I met you at my daughter’s house warming party … the Cromers. Small world huh?! Keep in touch! Yes, I remembered you guys from the party but I don’t remember if you mentioned a website or anything! It’s good to have one, helps people you know, not in the ‘cruising’ circle, keep up with you. Thanks, we will keep in touch for sure!